Let us work with you to design your perfect space! To start, bring blueprints or room dimensions along with any special ideas about your vision for the space. From the parameters set in our initial consultation, we will plan cabinetry with options for distinguished, efficient use of the area. The abundance of available options to choose from will determine how your cabinetry will look on the outside as well as how well they function on the inside. Wood specie, door style, finish, moldings, exterior hardware, inside slide outs, cutlery dividers, spice racks, lazy susans are just a few, and the list goes on. We are here to help guide you through the endless options Autumn Woods has to offer, as you select what is most suitable for your project. Design recommendations are presented in computer generated drawings specific to your cabinetry needs. Drawings allow you to view floor plans, elevations and even 3D images of cabinetry envisioned for the space. 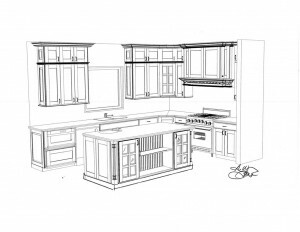 Taking ideas into reality, our team of talented craftsmen will build and install the selected cabinetry according to approved final plan specifications. Let Autumn Woods provide you with unparalleled design support, pride of craftmanship, and complete attention to detail. By working directly with us you simply get more for your money and superior product. Our work does not stop in the kitchen. Our complete custom shop allows for virtually any cabinetry solution - let Autumn Woods help make your dream a reality.